On 26 March, twenty days after hoisting his flag at Spithead, Rear-Admiral Alan Gardner, the newly appointed commander-in-chief in the Leeward Islands in succession to Vice-Admiral Sir John Laforey, departed from St. Helens with a squadron consisting of seven sail of the line, two frigates and a sloop. With him sailed two regiments of troops under the M.P. for Marlborough, Major-General Hon. 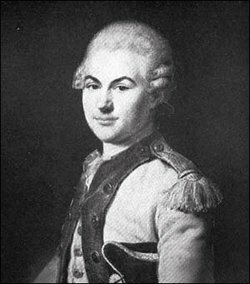 Thomas Bruce, the military commander-in-chief designate at Barbados. The commanders had orders to unite with French royalist sympathisers in the Caribbean who were rebelling against the decision by the revolutionaries in Paris to grant citizenship to their slaves, and to deprive the republicans of the rich source of income that the French West Indian islands offered. Such was the expectation of French royalist assistance that some newspapers reported that the British would only have to appear off Martinique and Guadeloupe to be sure of possessing them. 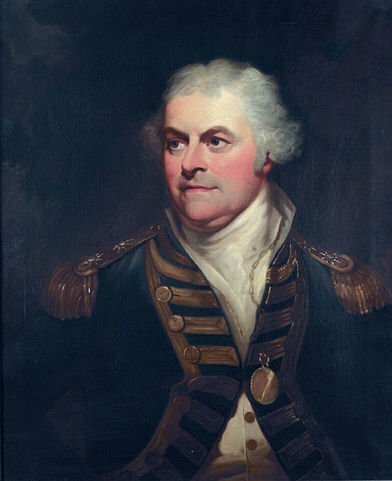 For Gardner there was the added incentive of commanding a station guaranteed to earn him a small fortune in prize-money if successful, and thus it could be alleged that as one of two naval officers on the Admiralty Board, the other being Vice-Admiral Lord Hood, he had engineered a much desired command for himself. Arriving at Barbados on 27 April after an uneventful passage, Gardner found that twelve days earlier Admiral Laforey had captured the ex-British colony of Tobago, previously ceded to France in 1783, with a force of four hundred and seventy troops under the command of Major-General Cornelius Cuyler, supported by his flagship Trusty 50, Captain John Drew, Nautilus 18, Commander Lord Henry Paulet, armed schooner Hind, and merchantman Hero. Although Laforey’s initial summons to the French governor upon arriving at Great Courland Bay on 14 April had been refused, a bayonet attack on Fort Scarborough at 1 a.m. the next morning had forced the French surrender with British losses of just three men killed and twenty-five wounded. The conquest of Tobago now ensured that Gardner was free to launch an attack on the most important of the French islands, Martinique. On 7 May Gardner entered Prince Rupert Bay, Dominica, where he learned that two French men-of-war, the Ferme 74, Captain Vicomté de Rivière, and the frigate Calypso 36, had recently come to anchor in nearby Roseau Bay with the white flag flying, and were desirous of joining the British. These vessels were added to his force which soon sailed to blockade Martinique, although it left without Gardner who had been unwell since his arrival in the West Indies, and who remained at Barbados with his flagship, the Queen 98, whilst Commodore Hon. George Murray commanded the squadron at sea. Meanwhile orders were despatched across the Caribbean for British troops to hold themselves in readiness for the forthcoming campaign. The key to Gardner and Bruce taking Martinique from the Republican authorities with the small amount of troops at their disposal lay in how much assistance they could expect to receive from the pro-royalist faction on the island, and given the traditional enmity between the two nations it was unsurprising that French suspicions of the British motives were rife. In particular the royalists wanted to know whether Gardner had come to take Martinique from the republicans in ‘trust’ for the King of France, in which case they would support him, or whether he had plans to annex it for the King of England, in which case they would resist him. Such a question no doubt severely taxed the fighting man, and not the diplomat, that Gardner was. On 31 May an emissary from the Army, Colonel Myers, returned to Major-General Bruce after conferring with the royalists to report their opinion that a limited British appearance would allow them to carry the island by a ‘coup de main’. A week of prevarication passed before a further deputation of royalists came offshore and announced that they were in possession of several key posts, and that a small force of eight hundred British troops would undoubtedly encourage the more reticent royalist sympathisers to put their head above the parapet, and allow them to persuade all bar the republican forces in Fort Bourbon to submit. Believing that they would now have sufficient resources to seize the island Gardner and Bruce decided to act. On 10 June the British troops were embarked at Barbados, and plans were advanced for an attack on the two batteries protecting the town of St. Pierre, where the republican governor, General Donatien Marie Joseph de Vimeur Rochambeau, was based. By the 15th eleven hundred British troops had been landed under cover of the men-of-war, and joined by eight hundred or so French royalists, of whom there were far fewer than the British had been led to expect, they had encamped about five miles from St. Pierre. Two days later the Duke 98, Hector 74 and Iphigénie 32 sailed in to bombard the batteries at half-musket shot, but in the course of their assault a thunderstorm rolled in and the Duke’s mainmast was badly damaged by a lightning strike. By now the batteries had largely been silenced anyway, and so under tow of the Hector the Duke withdrew and her mast was subsequently chopped away eight feet above the quarterdeck. On the morning of the 18th the two columns of British and Royalists troops began their march on St. Pierre, but barely any progress had been made before the royalists ludicrously opened fire on their own men, causing the advancing columns to assume that they were under attack by superior republican forces. With their commanding officer being wounded in this farcical episode the royalists refused to accept orders from anybody else and turned about for their camp. Aware that he had insufficient troops to continue with the attack, Major-General Bruce had little option but to withdraw, and after sheltering under the naval guns until the 21st all his men were re-embarked without further inconvenience. The failure of the undertaking left the French royalists on the island in an appalling predicament, and so Major-General Bruce took it upon himself to hire a number of vessels to bring them off, whilst the two French men of war assisted in the evacuation and carried their countrymen to Trinidad where their own vessels were added to the Spanish Navy under the existing officers. Nevertheless, it was estimated that two thousand royalists of various ethnicities were left behind on the island, and it was subsequently surmised that many of them were slaughtered. After despatching the Hector and Hannibal to reinforce the Jamaican station in line with Admiralty orders dated 3 May, Gardner returned to Barbados where, just to add to his problems, his squadron became badly afflicted by an outbreak of a marsh fever that had been brought to the Leeward Islands from Africa by a ship fleeing the embryonic colony of Bulama. By now the folly of despatching his squadron with insufficient troops to undertake an effective campaign in the Caribbean had been realised, and having failed to achieve anything of note, and continuing to suffer from ill health, the chastened admiral set off for home. On 1 October he arrived at Spithead, having left the Leeward Islands with the Queen 98, Duke 98, Culloden 74, and Heroine 32 from his original squadron, together with Vengeance 74, Captain Charles Thompson, Andromeda 32, Captain John Salisbury, the storeships Experiment and Ulysses, and the West India convoy of one hundred and thirty sail. Shortly after landing he set off for London. Although the newspapers blamed the failure of Gardner’s campaign on the delusive promises of the French royalists, the undoubtedly gallant admiral did not escape criticism, not least from his subordinate officers who felt that he wanted decisiveness, and in particular were unhappy that he had failed to take advantage of the opportunity to attack the lucrative French West Indian trade. A later commentator who had served aboard the Duke as a lieutenant, Admiral Sir William Hotham, commented of Gardner that ‘in chief commands he seemed to shrink from responsibility, and was painfully nervous, the consequence which frequently happens of an honourable but overstrained effort to do right’. The Government ensured that the next expedition to the Leeward Islands, sent out under the command of the accomplished Vice-Admiral Sir John Jervis in the following December, was far better manned, and as it also proved to be far better led it proved to be far more successful.